Electric heater base for poultry drinking water helps prevent water from freezing over. This heater base can keep water at drinking level up to temperatures as low as 10 degrees F. This heater base is designed for use with only metal double wall founts by Little Giant and other all-metal containers. It’s perfect for dry sheltered areas and unheated barns and coops. The unit is made of rust-resistant, heavy duty galvanized steel. Make sure that the cord is protected from the animals. It’s energy efficient as it will not draw electricity unless the temperature is below freezing. 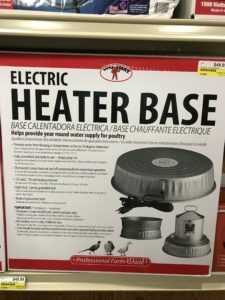 Electric Heater Base for Poultry Founts is now available at Argyle Feed Store. This entry was posted on Wednesday, December 20th, 2017 at 11:36 pm	and is filed under Chicks, News & Updates. You can follow any responses to this entry through the RSS 2.0 feed. Both comments and pings are currently closed.